Dave Sim Cerebus the Aardvark #6, Complete 22-page Story "The Secret" Original Art (Aardvark-Vanaheim, 1978). Dave Sim takes the first step toward the glory days of this series in this story, "The Secret," in which Cerebus is drugged and falls in love with a tavern wench named Jaka. 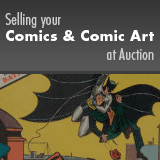 Each page has an image area of 10" x 15" and is in Excellent condition.